The first time I saw my name in print was in 1992, when I worked as the “desktop publishing specialist” for Technology Research Group, a small semiconductor and software consulting firm led by the visionary Andy Rappaport. My main job was making PowerPoint presentations from Andy’s faxed sketches (and getting them made into slides…actual slides…from a photolab at $20 per slide.) But thanks to the collaborative atmosphere that Andy had established, I was treated as a contributing member of the team—and even given the chance to write a column in Electronic Engineering Times. As a 25-year-old art history major in her first job, it certainly was a Big Deal. I came across a copy of this column about a week ago and discovered a forgotten assertion that ended up being accidentally far-sighted. Even though it celebrates a relatively unknown piece of software (T/Maker’s WriteNow), the article does make the case for the shift from applications to apps: a toolbox of digital tools, each crafted to solve a single need. Who knew the transformation would take place in the palm of your hand? The rules of the software market are changing, and it is the users’ concept of utility that is driving the market to favor smaller developers over their larger competitors. Despite the current tactics of the major companies, tomorrow’s software packages will not be more feature-laden versions of these available today. Consumers, tired of the features war, will dismiss overextended packages and seek applications that are practical, specialized tools. 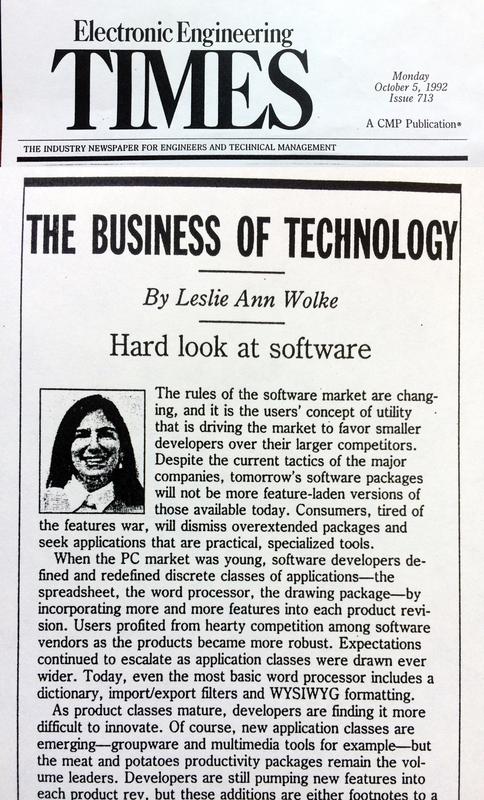 When the PC market was young, software developers defined and redefined discrete classes of applications—the spreadsheet, the word processor, the drawing package—by incorporating more and more features into each product revision. Users profited from hearty competition among software vendors as the products become more robust. Expectations continued to escalate as application classes were drawn ever wider. Today, even the most basic word processor includes a dictionary, import/export filters and WYSIWYG formatting. As product classes mature, developers are finding it more difficult to innovate. Of course, new application classes are emerging—groupware and multimedia tools for example—but the meat and potatoes productivity packages remain the volume leaders. Developers are still pumping new features into each product rev, but these additions are either footnotes to a long list of checkboxes or unnecessary gimmicks borrowed from other application classes. Because there is little left to differentiate one beefy application from another, large software vendors have begun to complete on price to sustain market share—a signal that they can find no meaningful way to improve the content of their products. However, what a few small software companies have discovered is how to take advantage of merging marketing trends to develop streamlined, function-specific applications. One such company is T/Maker, an agile software developer that deciphered users’ needs and redefined the word processer market. T/Maker’s first insight was an acknowledgement that bigger isn’t always better. Feature-rich applications require lots of RAM and hard disk space. Although memory is cheap, notebook users still bump up against memory limits when they run applications that were built for the desktop. Comprehensive packages also lose performance and gain complexity as more features are implemented in each product release. T/Maker left out extraneous features that could best be done in another application. Further, since advances in operating systems like Microsoft’s Object Linking and Embedding (OLE) and scripting allowing applications to work together more seamlessly, users are now more willing to collect a suite of applications. They want a toolbox instead of a second-rate Swiss army knife. As a result of its insightful implementation of WriteNow, T/Maker is a successful company. Could a large software company product an elegant little product like WriteNow? It is unlikely that one of today’s big players could replicate T/Maker’s fresh attack on what was believed to be a mature and exhausted product category; neither could they compete with T/Maker’s time-to-market. As small software companies emerge as leaders in specifically-crafted applications, the business model of their larger competitors must change. Tomorrow’s software market will demand fast reaction to discontinuities between what the market sells and what the user needs. In fact, the large software company of the future may best compete by becoming a holding company for a collection of small software developers, thereby fusing the marketing and distribution strength of a large company with the speed and ingenuity of a small one. Leslie Ann Wolke is a consultant with the Technology Research Group (Boston), a consulting firm that advises semiconductor and software companies. 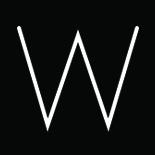 This entry was posted on August 25, 2015 by lwolke in Blog, Publications.